SMIDGE OF THIS: Five On Friday: Thanks! Big, big through-the-screen hugs to each of you who have shared in our excitement about having another baby. I am due April 6th (but Camille arriving 9 days after her due date has me seriously side-eyeing due dates in general). So, let's just say sometime mid-March through mid-April? I have felt very similar to how I did with Camille ... GREAT. I definitely have had the urge to nap all the time (too bad that almost never happens!) and the first few weeks were filled with weird symptoms that I do remember having with Camille ... extreme thirst, major hunger through lunch and then feeling very uninterested in dinner, and being really, really cold at night. 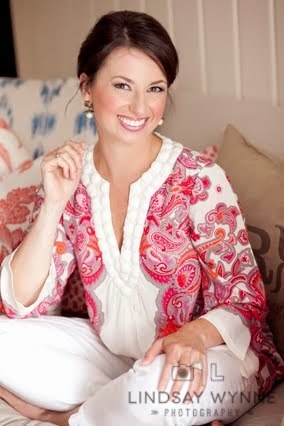 I was snuggled up on the couch every evening in sweatpants, a long-sleeved tee, and a faux fur blanket in August and September while Ian just thought his wife had gone loony. I've also mentioned bad pain in my lower right back that appeared basically the moment that I saw that positive test. Not sure if it happens to be tied to this go-round or if it's just due to staying at home with Camille now and bending/stooping/lifting much more than I ever did at my office job. I have been seeing a chiropractor who is great with prenatal care in hopes of getting some relief! And in the meantime, a girlfriend highly recommend this Prenatal Yoga DVD from Amazon to me for back-strengthening yoga exercises, so I will give that a try. I had two really good questions about the Essie Gel Setter gel polish that I mentioned earlier this week: 1) what's the removal process like, and 2) how does it affect your nail health. First of all, it comes off easily with regular nail polish remover. No trips to the salon, soaking in acetone, or weird LED lights necessary for this polish. And secondly, I've been using Essie Gel Setter for three weeks now, and I have not noticed a decline in my nail health or nail strength one bit. That's actually the reason why I don't like salon gel manicures anymore ... once the polish was removed from my nails, it left them weak and brittle. No good. I made two VERY easy crockpot dinners this week! Wednesday night I went super-simple and cooked boneless chicken tenderloins in buffalo sauce. Once they were done, we topped them with some blue cheese crumbles and had a little blue cheese dressing on the side for dipping. 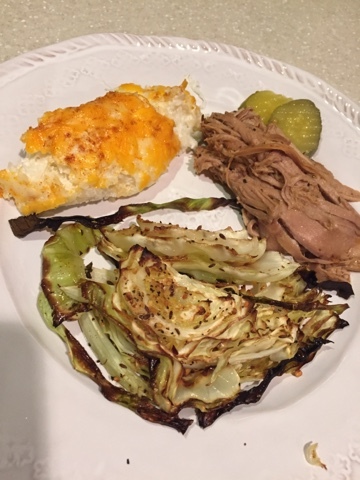 The other go-to crockpot dish we love -- I made this Monday and we had it two nights in a row -- is a pork tenderloin done in the crockpot with my favorite marinade ... the brown sugar bourbon packet from Grill Mates. I typically try to pick these up from the grocery store when they are marked down to 10/$10 so I can score a packet for a dollar. This iPhone snap leaves a lot to be desired, but you get the point. The pork cooked all day in the brown sugar bourbon marinade until it shredded. We had it with mashed cauliflower and roasted cabbage. My latest naptime binge-watching obsession: Dallas Cowboys Cheerleaders: Making The Team. I finished the latest season (I don't even know when it originally aired?) and watched it on demand on CMT. This is definitely the only show I've ever watched on Country Music Television ... but I loved it! The girls are incredibly talented, and as I laid there on the couch nursing a hurting lower back and eating Snickers Minis, I was feeling just a tinge of jealousy. 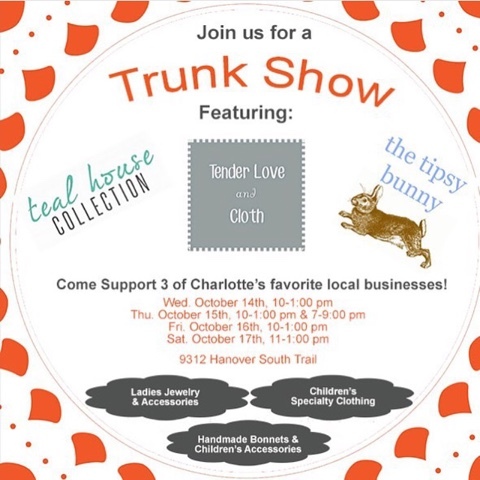 A quick trunk show reminder... today and tomorrow are the last days of the show! I hope you will come out and say hello -- it has been an awesome trunk show so far and I'm really thankful to my sweet friend for hosting us! If you are not in town and want to check out The Tipsy Bunny shop on Etsy, you can find it here! CONGRATS on the new baby news, that is soooo exciting! I'm an April baby, so April sounds like a fabulous month :)! 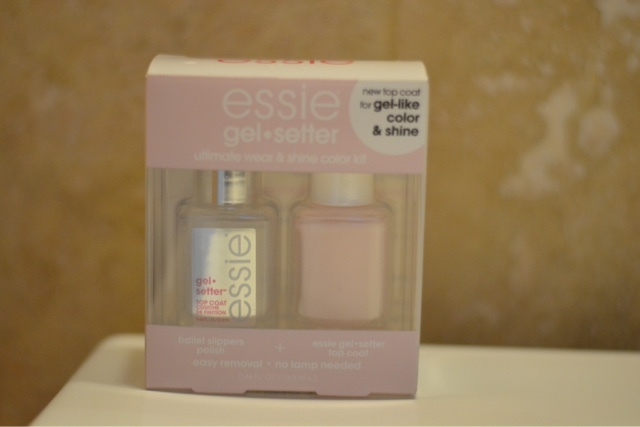 Thanks for the info on the Essie line, I like nail polish that lasts awhile but HATE how gel manicures damage my nails. I'm gonna check this out, wooho! GIRL, I've been on the DCC train since the show first aired [2006 I think]. You can watch old episodes on CMT.com and I do sometimes when I need a lil distraction. Kelli is fabulous and I LOVE watching the girls dance, they are soooo talented. So glad you are feeling well and hope the back pain subsides! And I tried a pork loin crockpot recipe this week and was none to impressed. I will definitely try this one!! So glad to hear you watch making the team. I thought I was the only one! I agree, the ladies are amazingly talented, and I cannot believe how much work it takes! I'm considering the Essie set. I too gave up salon gel because it just seemed to kill my poor nails. Congrats on the sweet new addition to your family - what wonderful news! I get really cold when I'm pregnant too. Which kind of is confusing because most people get really hot. I hear GREAT things about that gel setter... still need to try it! and YAY for two babes. It's crazy town over here most the time, but I love it so much. Congrats on the baby news!!! Hopefully you start feeling somewhat comfortable soon, but that show is great, that's the only thing I watch on CMT also, such a fun show to watch :)! For the pork recipe, did you add any liquid (or is it on the packet?) I'm looking form quick and easy weeknight meals! I love crock pot meals. Again, congratulations! I am so happy for your family and glad that you seem to be feeling pretty good! Ah, how did I miss the baby news!? Congratulations! And I'm jealous you have the patience to do your nails.... I have none! Congratulations on baby #2! 2016 is shaping up to be another year of the baby. And I too really liked the DCC show. Those girls have so much talent! oh and, Dallas cowboys cheerleaders..also obsessed. I DVR the episodes and watch them at night after hubby falls asleep! CONGRATS on #2!! Super pumped for y'all!!!! Also - you are on the ONLY other person I know who has watched the Dallas Cowboys Cheerleaders show. Although I will say that my 7-month-old son likes to take a peek at those lovely ladies when I'm watching it. Such a little man! Congrats to you and your family on Baby #2! Can't wait to follow along on this journey with you! We too love those McCormick Grill Mate packets in our house! They are so delicious and make the quickest, easiest marinade! Congrats on baby #2, that is so wonderful!! Thank you for hosting us and you look marvelous! for all of you - can't have too many grand babies. My 2 have been the lights of my life. Your lower back pain may be coming from your SI joints... I had a TON of it when I was preggo with my first, and my chiropractor said that's what it was. It should be gone once the pregnancy is over, though! Just be careful how you bend so you don't irritate it further. I, unfortunately, had a traumatic delivery and it further injured mine, so four years later I still have pain. That's very uncommon, though, but I always like to make other mommas aware so they don't end up in the same boat! I love that show - I've watched it for year and I'm not really big into football! Mmm I need to try some of those crock pot ideas! I love the gel setting polish too, the gel manicures from the salon totally ruined my nails. It took months to get them back to normal! And congrats on your exciting news!!! So so happy for you, April! Congratulations to your sweet family! So happy to hear you watch making the group. I thought I was the just a single! I concur, the women are incredibly gifted, and I can't trust how much function it takes! I'm thinking about the Essie set. I too surrendered salon gel since it just appeared to execute my poor nails. Congratulations on the sweet new expansion to your family - what brilliant news!